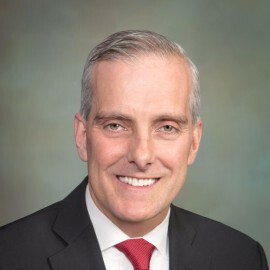 Denis McDonough served most recently as White House Chief of Staff for President Obama’s second term, managing thousands of staff and providing strategic advice to the President on the most significant domestic policy, national security and management issues of the day. Prior to being named Chief of Staff, he served as the White House Deputy National Security Advisor. McDonough’s distinguished career includes working as a senior foreign policy advisor to Senator Tom Daschle and as legislative director to Senator Ken Salazar.